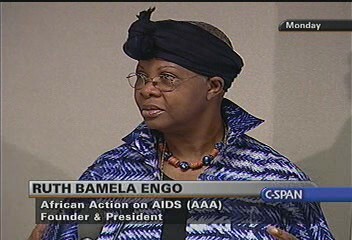 C-SPAN Video: African AIDS Epidemic featuring Ruth Bamela Engo. African AIDS Epidemic Ruth Bamela Engo talked about the African AIDS epidemic, the lessons learned, and more effective approaches for the future. She described spending most of her time in villages providing education for young people and conducting small-group conversations with women. Other topics included AIDS prevention, the large numbers of HIV-positive persons, orphans, poverty, malaria, and diarrheal diseases. After her presentation Dr. Engo responded to audience members’ questions. © 2013 African Action on AIDS. All Rights Reserved.